As much as we love webOS, we know there's plenty of reason to move on to other platforms. Progress on the webOS Ports porting to other devices is going to be slow by the very nature of the open source work, and we have no guarantee that LG's ever going to bring webOS to smartphones or tablets again. Eventually our Pres and Veers and Pixis will stop working, eventually HP will shut down the cloud servers, eventually we'll have to start looking at what the other options are out there. When it comes to the multitasking prowess of webOS, there's still no equal, in our less than humble opinion. So what if you're looking at an iPhone? Is double clicking the home button to see the icons of your running apps really going to do it for you? We think not. Thankfully, webOS Nation Forum member i_maq dug through the iOS jailbreak scene (jailbreak? how sad they have to call it that) to find all the additions you'll need to make iOS look and behave more like webOS. i_maq found a number of useful installs, including enabling webOS-style app cards, gestures to switch between apps, a JustType kinda-sorta-clone, individually-dismissible notifications, and even rounded corners! Of course, if you're going to jailbreak your iPhone you're going to have to know how to do that. Thankfully, our friends over at our iPhone-obsessed sister site iMore know all about that and have detailed how-tos that explain exactly what you need to know and need to do. We know that many of you have switched to iOS already (your friendly neighborhood editor-in-chief actually has an iPhone on one of his lines - don't judge). Those of you that have, did homebrew spoil you to the point where doing this was but a foregone conclusion? And those that are considering a switch - does this sway you in any way? Sound off in the comments. In the wake of the news that Google intends to shut down one of our most beloved services in the form of Google Reader this summer. We're as devastated as you are. While a number of outfits were quick to state their intention to pick up the mantle and run with it in one for or another, getting them to make a webOS app is another matter. But… there are already apps for webOS that will let you get your RSS on. One such app - Headlines 2 by The CodingBees - brings you your RSS feeds and includes handy features for TouchPad users like background syncing, offline article caching, optimized reading modes, and more. Plus we've got 100 copies to give away, all you have to do to have a chance at winning is submit a comment after the break! Contest: We have 100 copies of Headlines 2 to give away. Just leave a comment on this post to enter. Contest ends next Sunday at midnight US Eastern Time, after which time we will select 100 random entrants to win. Please only leave one comment, multiple entries won’t count. Promo codes are only valid in countries serviced by the App Catalog, and users must be running webOS 3.0.4 or higher with the latest version of the App Catalog. Using cards in webOS has always been a great way to multitask on a mobile operating system and works just as well on the TouchPad as well. However, if you have a lot of cards or stacks open, you may find yourself doing a lot scrolling to find that app you want. 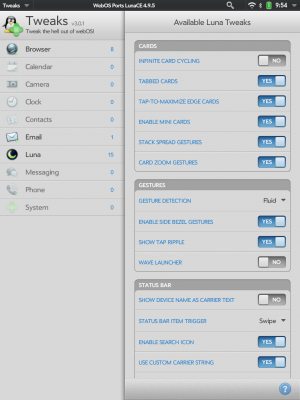 If you have installed LunaCE--the homebrew update for the TouchPad by WebOS Ports based off the Open Source "webOS Community Edition" (not to be confused with Open webOS)--you can enable mini-card view or set your own card zoom level to see more open cards at once. Another option that LunaCE gives you is the ability to loop through your cards, so you can keep scrolling when you get to the last card to bring up the first card. It also works in reverse, where you can scroll continue to scroll to the right after you have reached the first cad and it will bring you to the end of the list. Note that LunaCE is currently in beta so you will need to go through the process to set-up the beta feeds in Preware, which can be found at testing.preware.org. In addition, you will need to have Tweaks installed on your TouchPad to toggle this new feature. Once you have both of them installed, you just need to go to the "Luna" section of Tweaks and toggle "Infinite card cycling" to YES in the "CARDS" section to activate this feature. Monday Brief: Android craziness, BlackBerry madness and more! Save 15% on ALL accessories in our St. Patrick's Day Sale! Saint Patrick's Day falls on a Sunday this year, so we're going to celebrate all weekend long here at webOS Nation with a webOS Nation Store sale!! Until Sunday, Midnight PST, you can save 15% on ALL accessories by using coupon code shamrocks at checkout. The long-awaited Enyo rewrite of Preware is here, at least in an alpha form. 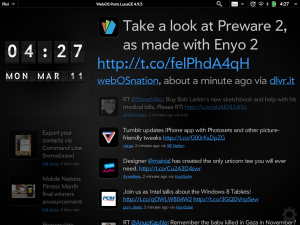 Version 2.0.1 of Preware has landed in the WebOS Internals feed alpha feed in Preware, offering an Alpha look of how Preware will look and operate as an Enyo app. The old Mojo-based version of Preware launched more than three years ago and despite numerous upgrades never moved away from that legacy codebase. With Open webOS no longer support the old Mojo framework, the time was now to rebuild Preware with Enyo. Right now the Preware 2.0.1 alpha works in the most basic of senses. As developer Josh "shiftyaxel" Palmer points out, the alpha currently supports the installation, updating, removal, and launching of apps, patches, themes, everything else Preware has traditionally supported and not much more. Being an alpha, it's still in need of testing, so if you're trying out the Enyo Preware you're encouraged to share any bugs you encounter with the WebOS Ports bug tracker. Being an alpha release, you'll need to enable the testing feeds in Preware (if you're going to turn on the alpha feeds you might as well hit the beta feeds while you're at it). And, as always, we'll encourage you if you haven't recently to consider making a donation to WebOS Internals and WebOS Ports - these organizations are dependent on your generosity to bring the webOS homebrew works you love to life. While dashboard notifications have always been a hallmark feature of webOS, the ability to stack notifications in webOS 3.0 on the TouchPad was a great enhancement because it allowed you to do things like view and dismiss one email at a time instead of all the new emails that recently arrived. Unfortunately, you still needed to view the email notifications in the order they arrived so there was no way to keep a notification in the dashboard while still moving to the next email. Your only choices were to leave all the remaining notifications in the dashboard, dismiss one email notification, or dismiss them all. But, as is another hallmark feature of webOS, the homebrew community created a nice workaround for this issue. 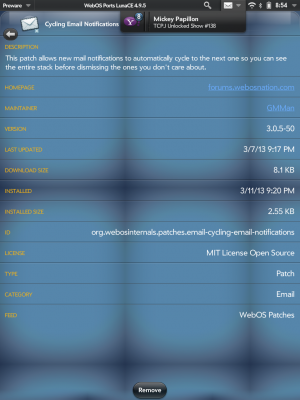 If you install the Cycle Email Notifications patch by GMMan, available in Preware or webOS Quick Install, your email notifications will automatically scroll from one message to the next every 5 seconds or so. They will cycle while you are working on the TouchPad, in exhibition mode, or even on the lockscreen. While it may take a little bit of time if you have a lot of notifications, this will at least allow you to keep or dismiss only the email notifications you want. 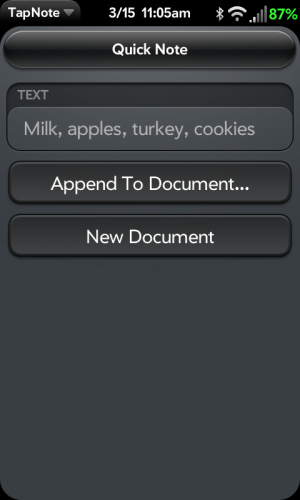 The founding utility of the webOS homebrew scene has gone open source. WebOS Quick Install was first released by Jason Robitaille back in 2009 and it has served as the backbone for homebrew app installations ever since. The robust Java-based desktop app runs on Windows, Mac, and Linux, installs apps, themes, kernels, and patches from multiple homebrew sources, and with the latest update to version 4.5.0 has gone open source for the masses. Open source seems to be all the rage these days. Despite its vital function in the webOS homebrew and open source development scene, WebOS Quick Install to this point has been a closed source application. 4.5.0 changes that, open sourcing both Quick Install and the webOSLib Java library. By open sourcing webOSLib, developers will be able to utilize the library to install Novacom drivers (open sourced by HP), list connected webOS devices, transfer files, execute shell commands, install apps and patches in compliance with webOS homebrew standards, and more. Both webOSLib and WebOS Quick Install are up on GitHub now in full open source. You can download and compile yourself, make and submit improvements, or even fork it off into your own webOS homebrew project. Whatever floats your metaphorical homebrew boat. And, as always, if you find yourself appreciating the work Robitaille's done, hit up the source link below to offer up a donation of thanks. When Exhibition mode was introduced with webOS 2.1, it gave developers the ability to create whole apps or just a subset of features without the typical concerns like power consumption. If you had an app that required updating every few seconds or minutes, such as stock quote or sports score app, you would eat through your battery life extraordinary quickly. However, if you were to know that the device would always be charging on a touchstone with the screen on, you would have a lot more freedom in what you could do. This can be extremely beneficial for social networking apps that require a real-time feed for updates, such as Twitter or Facebook. In the case of an exhibition-based Twitter app, your best option is Flixi by Under Clouds Games, available in the HP App Catalog for $2.99 and recently updated for the Twitter 1.1 APIs. Flixi is not technically a twitter client, but rather a multi-purpose screensaver app that gives you the ability to view multiple types of information on the screen at the same time. This can include the weather, a RSS news feed, the time, your Google calendar, a twitter feed, or more, and can be arranged in one of 17 pre-arranged layouts. Once you open up the app or switch to it in Exhibition Mode (make sure you have already added it to your list of active Exhbition Apps), just tap the settings icon and set up your dashboard as required, selecting Twitter for at least one of your panels. Once logged on to Twitter, you will see an almost real-time update of your Twitter feed in the app. There is no action needed to refresh the feed, it will do all the work for you. But be advised that Flixi is not a full-scale Twitter app. You can only see the latest 40 or so tweets, but you can not reply to tweets in the app itself, nor get access to the history view of a twitter "conversation." While you get quick at-a-glance updates to twitter and even load up a website with an in-app browser, you will still need a full Twitter app or go to Twitter.com to post new or interact with any tweets. Monday Brief: New CrackBerry launches, 2InstaWithLove, and more! Mobile Nations Fitness Month final winners announcement! Monday Brief: A BB10 update, webOS sold to LG, more MWC, and more!